From a small stitch to a surgery – Day Care Treatments for all hospitalization less than 24 hours. WHY CHOOSE RELIGARE HEALTH INSURANCE? Age of eldest member in the Porting policy is below 45 Years. Age of eldest member in the Porting policy is above 45 Years. What is health insurance portability ? Health Insurance portability means shifting health insurance policy from one health insurance Company to another. With this, the consumer does not lose the benefits you accumulated in the previous policy. Reasons why you would like to port to Religare Health Insurance ? Tailor made policies for your need. 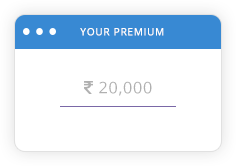 Better value for the premium you pay. Increase in Sum Insured possible. What are the Rights of a consumer under the health insurance portability ? Which health insurance policies can be ported ? What are the responsibilities of the consumer while porting a health insurance policy ? Which all products of Religare Health can you port your policy to? Are there any additional portability charges?